Who would have thought that I would find anime at our local public library. My friends and I were just passing by and then we see DVD's of recent movies like House, High School Musical, and even some teen flicks which I thought was weird. They even had the Mama Mia Soundtrack which I immediately borrowed. 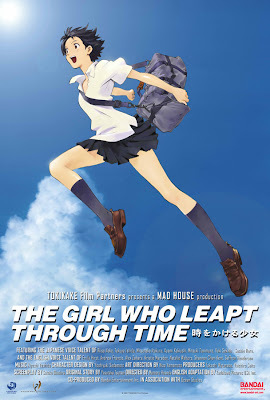 I was pretty fortunate to have come across the anime, "The Girl Who Leapt Through Time". It's been several days since I've last watch any anime so I was pretty excited to watch this one. Well as the title goes, Makoto is a girl who was able to Time Leap after encountering a device from the future that enables her to go back in time. She abuses her powers from going back in time to get more sleep or eat her favorite dessert. She then realizes that there are limits to the number of time leaps that she can make and that every time she changes something for her benefit, aweful things happen to the people around her. How amazing it would be if I were able to make time leaps. There are so many things in my life that I wish I could have done differently or I wish I never did in the first place. I have many regrets and I worry about the consequences of my actions. But as Makoto learns, being able to go back to change things makes some things worst and that there are some things that can never be changed because they just happen. Right now I wish I could time leap and change the person that I have become right now but I have come to realized that I should just accept whatever I have done and just go on with my life. I still believe in fate and that there are things that are really unavoidable. So right now I will live in the present and dream of the future.